The day began in Bilbao with a visit to the Guggenheim. 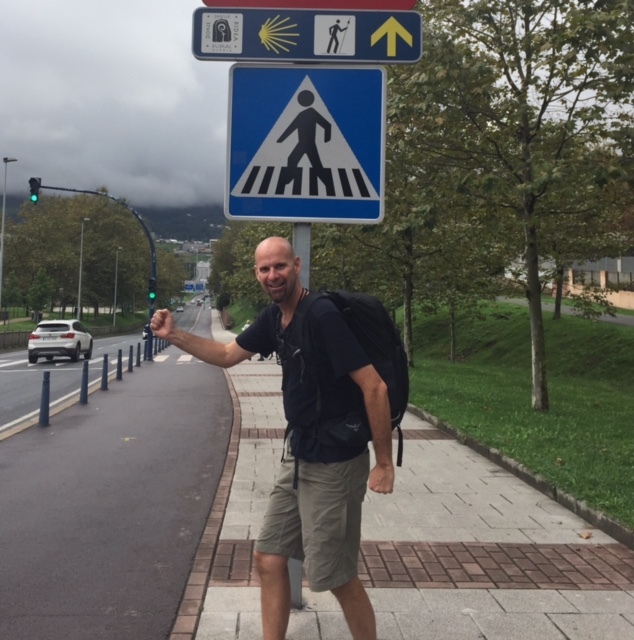 A short train hop to Portugalete and we emerged on the Camino de Santiago where we will journey for the rest of the month. We only walked about seven miles today but the terrain was varied and beautiful. We emerged from the train in Portugalete to a bustling Spanish town and stopped by a small grocery for some provisions. The Camino followed a bike path for several miles – all uphill. When we split from the bike path we roamed by small farms, each with a garden full of vegetables. We were greater by a shaggy goat-like creature that was missing his right horn. He seemed sad to see us go. As we began our descent, we had our first glimpse of the ocean in the distance. Before long we were at the beach and almost to our destination of Pobeña. We found the local alburgue and made arrangements to settle in for the night. In our first stay at an alburgue, we didn’t know quite what to expect. Think hostel with old people who are not hostile. The 20 or so folks ranged in age from 20s to 60s. At this point some had been traveling for 8 days and we were the new kids on the block. I was afraid of violating unspoken norms in a new community. Dinner was at a local place offering menu peregrino. The Pilgrim Menu was a ton of food and a bottle of wine for €10 each.